Now your Bitrix24 Deals section has a new dashboard – a bright report page which reflects deals analytics. You will be able to easily switch between deals list and dashboard pages with the help of top bar tabs. New dashboard has 8 “ready to go” analytics widgets, which you don’t need to be specially configured and can be used for sales analysis. 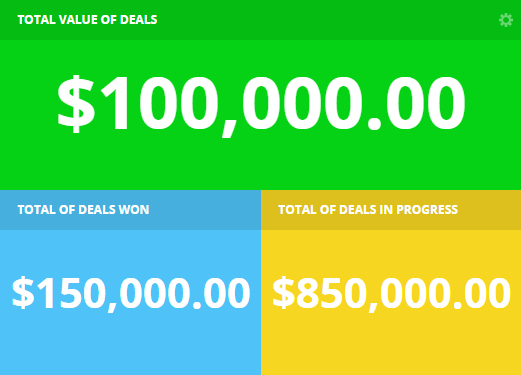 The widget shows the number of deals at each stage. 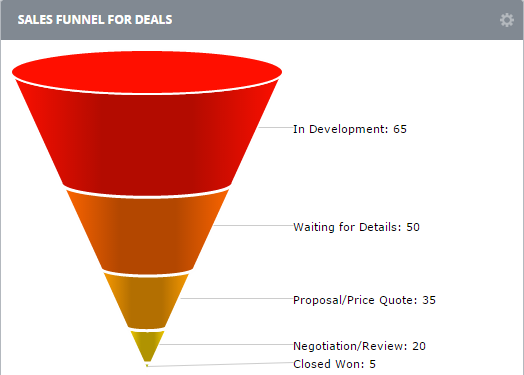 It can help evaluate the effectiveness of sales manager’s work with deals – the analysis reflects the number of deals that reach the final stage. The report period can be configured in the widget’s settings. total of deals in progress - the value of deals which are still “in work” – this amount is counted automatically as the difference between total value of all deals and total of deals closed won. The widget parameters are quite flexible and can be configured according to your needs: you can set reporting period, select deal stages and also set actions for the 3rd ( C) widget section – difference, amount or percent. Widget sections color can be customized as well. The sales rating will help to increase motivation between sales team members. The rank is calculated automatically by comparing closed won deals amount between users. The widget also advises what the 2 closest ranks amounts are, so that the sales manager can have an idea of how far away from upper and lower rank his own rank amount is. Even when the deal is closed won this may not always mean the invoice has been sent to the customer – this widget helps to control this. 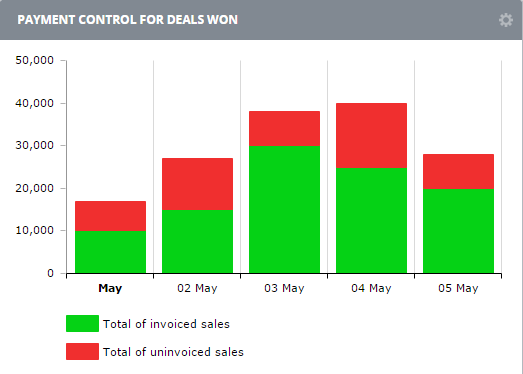 The chart has 3 sections – amount of invoiced sales, amount of uninvoiced sales and total amount of all deals closed won. Total of invoiced sales – total amount of all invoices of the selected deals. Please note that the system selects only deals within the report period (e.g. all deals closed won for this month); the total amount is calculated from all invoices bound to the selected deals ( e.g. even if the invoices have been made in the previous months, but are bound to any of the selected deals – these invoices will be countered). 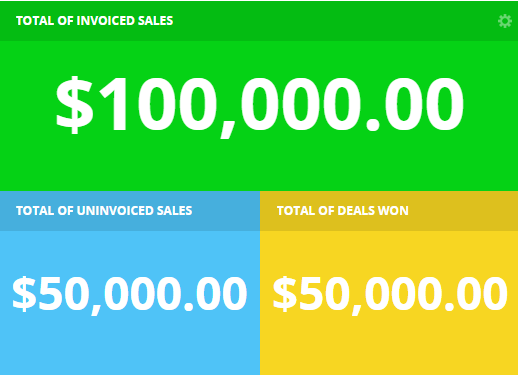 Total of uninvoiced sales – total amount of deals closed won but not invoiced yet. This is the chart widget of the previous one, it helps to evaluate the amount of uninvoiced sales that need to be finalized. The chart can also be configured according to your needs. The sales managers work efficiency can now be easily measured. 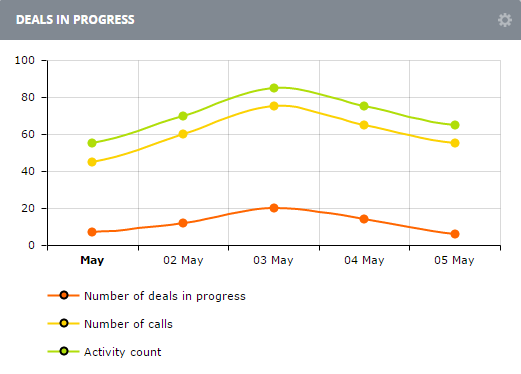 This chart reflects the number of deals the manager is working on, number of calls made and general amount of activities performed. Reporting period, deal stages and stats type to collect (e.g. number of meetings, emails, etc.) can be configured in the widget settings. You can also set grouping: by time or by employees. One of the most important widgets that advises which deals have been left aside – the deal stage hasn’t been changed, there were no activities or invoices. It allows to see the amount of deals on hold and access the filtered deals list. Deal stages used for reports construction are considered in groups (not individually), for example: Deals in progress group – all stages deal may have before it is closed (won or lost). 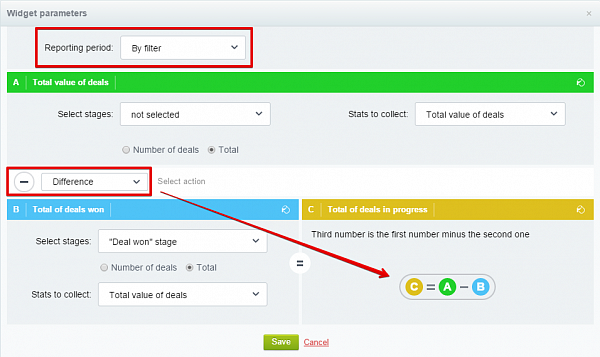 You can also add your own custom deal stages in CRM>Settings>Selection lists. Please note that “Deal’s start and end dates” is the key indicator, if the deal doesn’t suit the reporting period due to the start & end parameter – then this deal won’t be considered & reflected in the report widget even if there were any other activities on it in the same period. 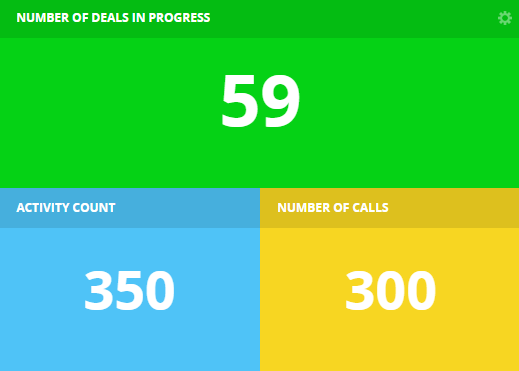 Number of calls – now calls are attached not only to the contact whom the sales manager have called to, but also are automatically added to the connected deal. That means if there have been any calls on the deal – this deal will be counted and reflected in the report.